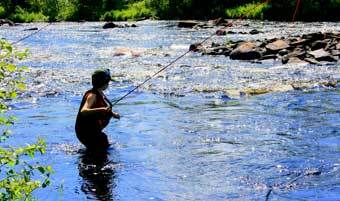 Älvdalen offers a great variety of fishing possibilities. 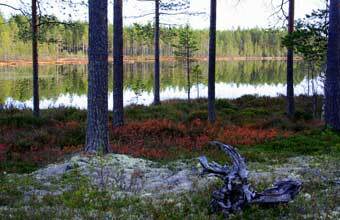 Besides the rivers, Österdalälven, Rotälven, Vanån and Tennån there are over 400 lakes and ponds in the area. In the streams and rivers there are mainly trout and grayling, in the small forestlakes trout and char. There are also many lakes that holds pike and perch. Most of the waters are easy to get to, since there are miles of small roads in the whole area. But there are also places, far from the roads, deep into the wilderness for all you adventurers. The fishing in the rivers and streams is on top from the beginning of may til the end of july. During this period the hatching of all the insects take place. But also the sep-okt fishing for grayling is fantastic. In the lakes it starts in june and goes on to late September. In the rivers the best way to catch trout and grayling is with a flyrod. Flyfishing is also a very good way to catch char and trout in the lakes. Though using a spinning rod is a more common way to fish the lakes for pike, perch and trout. Although pike is mostly caught with a spinning rod in the lakes, flyfishing for big pike is getting more and more popular. Please remember that the inhabitants in these waters are wild trout and grayling. Handle them with care and respect, and practice “catch and release”. Österdalälven, 23 km Älvdalens main river with predominantly grayling. 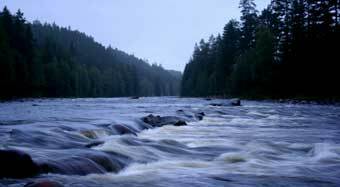 Rotälven, 46 km River that runs through plain wilderness. In the upper parts there are only trout, but in the lower stretches there are also grayling. Vanån, 28 km Smaller stream with trout and grayling..
Tennån, 24 km Interesting small stream with great Danica hatches and mostly trout. We are happy to share our experience with you!